Enter contest at bottom of the post via the Rafflecopter online giveaway tool. This is week #2 in our 10-Week Kids Yoga Resources Reviews and Giveaways. It is with great pleasure that I introduce you to my dear friend, teacher, and mentor, Katie Manitsas. My husband and I attended Katie’s Yoga Teacher Training at her Samadhi Yoga Studio (now Jivamukti Yoga Sydney) eight years ago. We had just gotten married and doing the training was a magical way to begin our life’s journey together. Katie is one of the most passionate, dedicated, intelligent, and hard-working people I know. She is a not only a studio owner, but also a mother of two (with another on the way), doula, author, and ayurvedic healer. 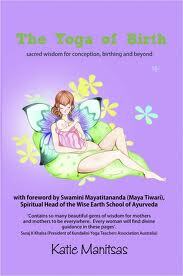 Today, I would love to share Katie’s book, The Yoga of Birth, which was my go-to resource when I was pregnant. Chart of the Ayurvedic Body Types (doshas) with associated pregnancy and postnatal recommendations. 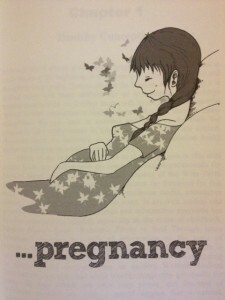 I am a “Vata” and felt validated when I read that Vata types are prone to post natal depression. Suggestion of Yoga Nidra as a way to relax. This worked for me tremendously. Recommended music by Snatam Kaur. I listened to the Grace CD in the afternoons while dozing. Her soothing music got me through five long months of morning sickness. Set an intention for your birth. I sat down a few days before the birth and made a collage with inspiring words and pictures to guide me through the process. It was a therapeutic and calming exercise. Breathing techniques when giving birth. I used the Extended Exhale technique through the contractions and birth. I channeled the pain through the breath and remained relatively calm and focused. Wrapping belly after birth. The hospital gave me a belly wrap which I wore for at least a month after giving birth. It really worked for me and made me feel that I was holding the energy inward. Creating rituals for feeding, playing, and sleeping. The mantra “This too shall pass” helped me go through the challenging and isolating journey of a new mom, with no prior experience and no family nearby. Baby massage techniques. I found the recommended book, Loving Hands, in our library which was an excellent resource. Tips for creating an eco-friendly environment. The yogi promise, Lokah Samasta Sukhino Bhavantu, which is translated as “May all beings everywhere be happy and free, and may the thoughts, words, and actions of my own life contribute in some way to that happiness and to that freedom for all.” I have been chanting and singing the yogi promise to our daughter before bedtime since she was born. She is now starting to say the words back. It warms my heart. This book is a true gift for a mom-to-be and I am honored that Katie has offered to send a copy to the winner of the following contest. We look forward to your entries. Thank you for taking the time to participate. Please let me know if you have any questions or problems with the Rafflecopter tool below, email at giselle at kidsyogastories dot com. To enter the contest, please sign in using your Facebook account or email, and click on the different ways to enter. You can enter every day using this Rafflecopter online giveaway tool. 1. International entries are welcome. 4. Please enter using the Rafflecopter tool above, obtaining points as follow the different options. You can enter every day. 5. No purchase is necessary. 6. Kids Yoga Stories and Katie Manitsas accept no responsibility or liability for any injuries or losses that may result from practicing the yoga poses in the books. Please ensure your own safety and the safety of the children. 7. You must enter the contest giveaway with a valid email address. The winner will be notified by email and at that time we will request your mailing address. The shipping of the book can take some time, depending on your location. 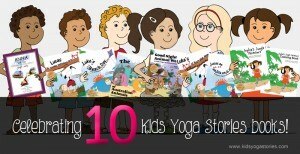 Kids Yoga Stories and Katie Manitsas will ship the books to you separately and will cover the shipping costs. 8. Let Giselle know if you have any questions by emailing her directly at giselle at kidsyogastories dot com. 9. The contest will close on Tuesday, October 14th, 2013, midnight PST. Like to know of other Contest Giveaways? Sign up for our weekly Kids Yoga Stories Newsletter (put name and email address into box at the top of the page) to get updates of the upcoming weekly giveaways! This is such an exciting giveaway! I teach prenatal classes as well as kids yoga classes. More information the better. I’m in desperate need of this! Doing yoga at home is my sanity from the discomfort of this second pregnancy! This is great! It is very important to know how to practise yoga, while being pregnant, as safe as possible! I’m currently 27 weeks pregnant and I teach prenatal yoga so I would get tons of use from this book! Entering for a pregnant friend!! but glad to know about this book 🙂 of course if I win I will keep the Kids Yoga Stories book for myself to use in my kids classes! Thank~you for the opportunity! This would be wonderful to win because I’m pregnant with my second child right now and my toddler loves yoga! so we’d both be winning!! Love this! I’m currently pregnant with our second child, and doing yoga with my first would be so much fun! I have a friend who I would love to share this prize package with! It’s funny, I literally just said to my husband today “Everyone says yoga is great during pregnancy, I should give it a try.” And then I saw this giveaway! I know a few poses but I’d like to learn more and integrate it into my life. I wanted to do yoga when I was pregnant with my first, but I didn’t know what I was doing so I just didn’t do it. I would love this for when I have another baby! My daughter can do it along with me too! My dear friend, who also lives with me, is having her first baby. She has time for a dedicated yoga practise. Already the pregnancy hormones are working, her body is changing and she would like to use yoga to open up more and be fully present and aware of all the changes this journey brings. I will buy her this book even if I dont win! I am a homeschooling mum, and my contribution to our little ‘free range learning’ community is free kids yoga. Its tons of fun and any books are welcome to my collection. Kids love books! This would be useful to me because my sister is expecting and is under a lot of stress – I started doing yoga a few months ago (my baby is six months old now), and found it very helpful for relaxation. My husband and I are also discussing “one more,” so there’s a chance my sister could return it to me when she doesn’t need it anymore. 😉 I also do a “Mom & Baby Yoga” DVD in addition to my weekly yoga class, so the kids yoga book would be useful once my son is a little older, since he’s already been introduced to it. 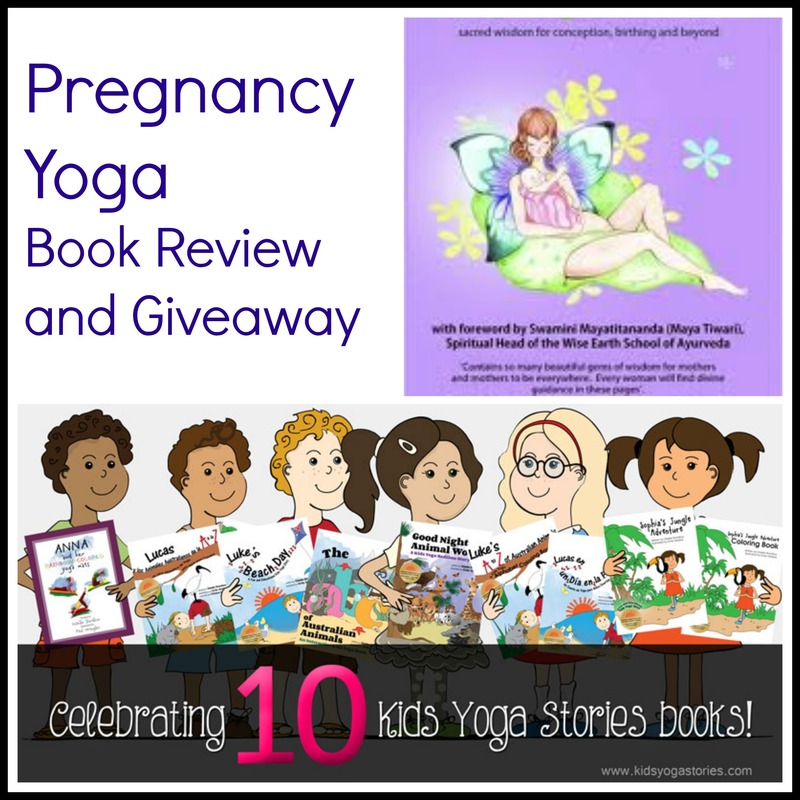 Thank you so much for participating in the Pregnancy Yoga book giveaway! Congratulations to Linda T. for being the winner. Watch for our weekly Kids Yoga Resources reviews and giveaways.